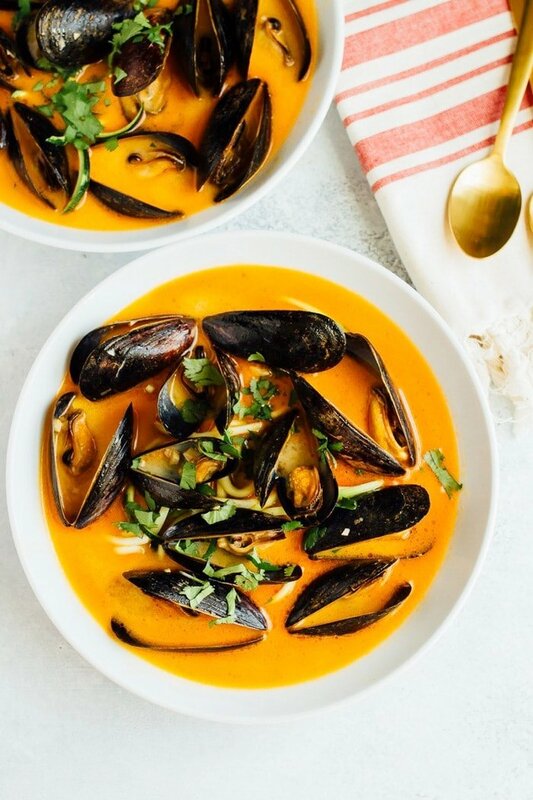 Coconut curry mussels are steamed in a red curry broth and served with zucchini noodles for a healthy, yet rich and satisfying appetizer or light meal. Gluten-free. Although I spend a lot of time in the kitchen there are quite a few things I’ve never cooked before. Many of these things are meat because I was pescatarian for six years, but there are a bunch of seafood items as well, including mussels. I don’t know why because Isaac and I both really enjoy eating mussels at restaurants. Well, I’m happy to say that a couple weeks ago I decided this needed to change. 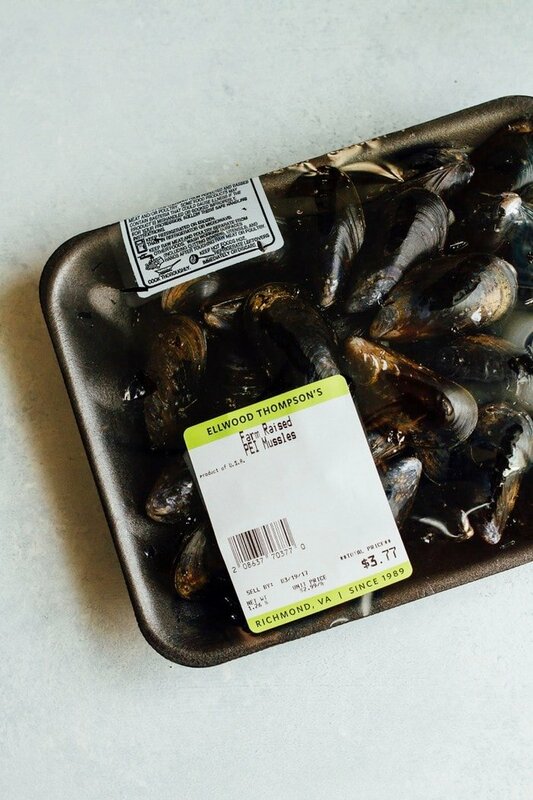 Fresh PEI mussels were easy to find at my local grocery store and super affordable. For whatever reason I thought preparing mussels was going to be labor intensive. But just like most things we build up in our heads to be super complicated, preparing and cooking mussels was so much easier than I thought. Plus, the dish I ended up creating is absolutely delicious. Be sure to clean and debeard the mussels before cooking. This process is super simple, but PEI mussels come debearded, an added bonus of working with these mussels. I thought about steaming the mussels in wine or beer because I’ve seen that done many times, but ultimately decided that a coconut broth needed to happen. One of our go-to restaurants here in Richmond, Saison, has a signature dish with seasonal seafood in a coconut-habanero broth so this sort of inspired the whole idea and then I decided red curry and zucchini noodles needed to be in there as well. 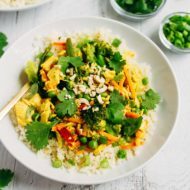 I’m sure you’ve noticed by the number of curry recipes I have here on EBF, but we have a thing for curry! 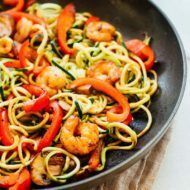 To keep things really easy with this recipe, the ingredient list is minimal with only 8 ingredients (not counting the olive oil and sea salt) and the steaming process itself takes no time at all. Once everything is prepped and the broth has simmered for a few minutes, the mussels will steam in about 6 minutes flat. Mussels are typically served with some sort of carby goodness to soak up the broth. Most often you’ll see them with crusty bread or french fries. I’m sure bread or fries would be amazing with this, but I decided to keep things light and healthy by adding zucchini noodles to the broth. 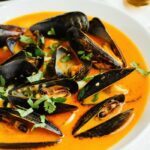 Once you’ve eaten the mussels and discarded the shells, you can enjoy the rich coconut curry broth like a soup with the zucchini noodles. 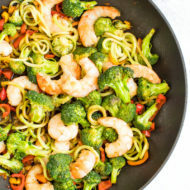 It’s so flavorful and having the crunchy texture from the zucchini noodles is perfect. And just in case you needed another reason to try cooking mussels at home you’ll be happy to know that they’re really healthy. 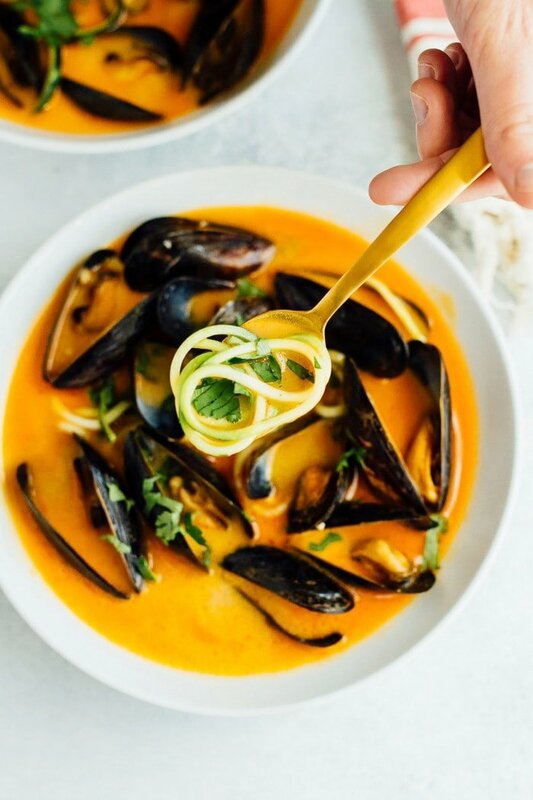 A 3-ounce serving contains over 20 grams of protein and they’re a good source of vitamin B12, manganese, iron and vitamin C.
These coconut curry mussels with zucchini noodles make for an easy appetizer or light weeknight meal. They seem fancy and impressive but actually come together really quickly without much prep work at all. Next time we have a dinner party I know exactly what I’ll be making as an appetizer! 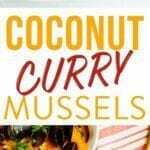 If you make these coconut curry mussels be sure to leave a comment and star rating below letting me know how they turn out! Your feedback is so helpful for the EBF team and other readers. 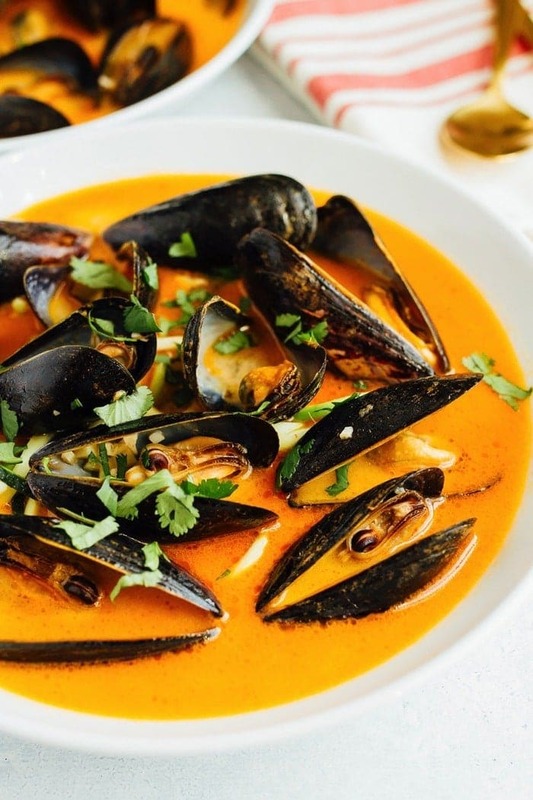 Coconut curry mussels are steamed in a red curry broth and served with zucchini noodles for a healthy, yet rich and satisfying appetizer or light meal. Scrub and clean mussels. Toss and mussels with cracked shells and tap any mussels with open shells. If the shell doesn’t respond by closing tightly, toss it (this means the mussel is dead). In a wide bottomed stockpot* over medium heat, add 1 teaspoon olive oil and garlic. Cook garlic until fragrant, about 3 minutes and then add coconut milk, curry paste, fish sauce, broth, lime juice and salt. Simmer broth for about 5 minutes. Add mussels to the stockpot and give them a big stir to coat. Increase heat, cover and boil broth until the mussels open, about 6 minutes. Grab bowls, add zucchini noodles to each and use tongs to transfer mussels to each bowl. Discard any mussels that do not open. Spoon some broth into each bowl, sprinkle with cilantro and serve. 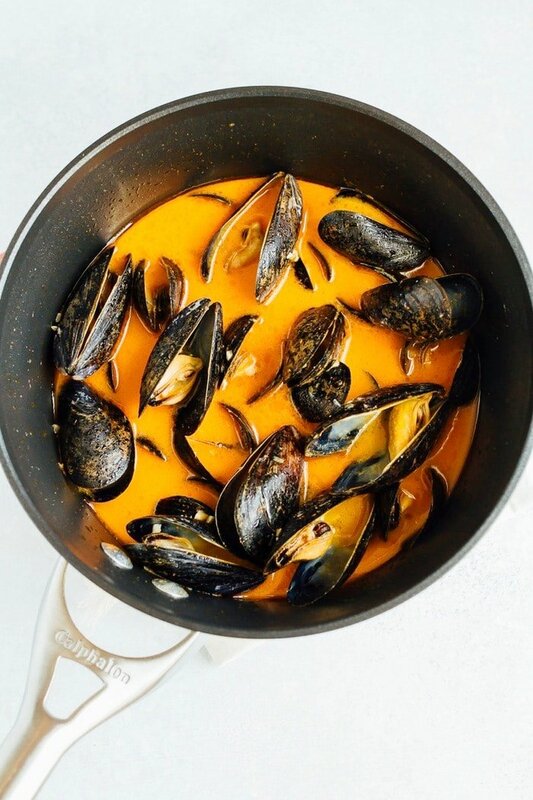 *Using a wide bottomed stockpot with ensure the liquid remains shallow enough to allow the mussels to steam rather than boil in the broth. This post was written by me on behalf of the Mussel Industry Council of Prince Edward Island. I received compensation for participating in the campaign, but as always all thoughts and opinions are my own. Thanks for developing the recipe and your tips for cooking them! My boyfriend and I love mussels, but I’ve never ever made them before! I feel a bit intimidated by them! Love the coconut curry flavors with them! I never met a mussel I didn’t like, but for some reason, I cannot stomach curry. Aside from that, everything in this dish sounds amazing! Do you have any recommendations for a substitute? What about a simple coconut broth? This recipe for coconut lime mussels sounds really good! Awesome thank you! I will definitely try that out! Loved the flavor! I would add more red curry paste next time, and double the lime juice. Super easy to make…thanks for the recipe. Excellent recipe. Just made this for supper and loved it. It is very quick to make and will make it again. Ahh! This makes me so happy. So glad you enjoyed the mussels, Linda!